It is a wonderful sight to see fifty eight sailing boats come into harbour, see their maneuvers and suffer with the tired crews when the wind forces them to repeat it. This experience takes me years back to 1999 when we first came to Kyrenia harbour with the 10th Emyr Rally; a long time ago it is but still as fresh in our memory as if it were yesterday. Hasan Kaçmaz, one of the founders and organizers, is again with this year’s rally, on his boat SY Ibis II; his wife Gonül is from Cyprus. Every year since 1999 we go down to the harbour to greet the sailors and we join them for a chat or a drink at one of the cocktail parties. Also this year the 58 crews were welcomed by TRNC president Derviş Eroğlu in the court yard of the Kyrenia castle where in 1999 the first president Rauf Denktaş had welcomed us. As we learnt from a German couple from Berlin on the occasion of another welcome party at Camelot Beach Club owned and organized by the Girne American University and their Marine Department, the rally had started in Istanbul on April 22 and had visited the ports on the way down south of Mürefte, Ayvalik, Çesme, Kaş, Didim, Datça, Göçek, Kaş, Finike, Kemer, Alanya and Kyrenia; they will have two more days on the island since they had to cancel their visit to Syria because of the political unrest. They will continue from Karpaz Marina on May 26 and will head for Jounieh in Lebanon which is another hightlight. From there they will go on to Haifa, Ashkelon to Port Said and Herzliah. They will then have made 1450 miles in 59 days – if all goes well – and will have stayed in 21 ports in five countries. 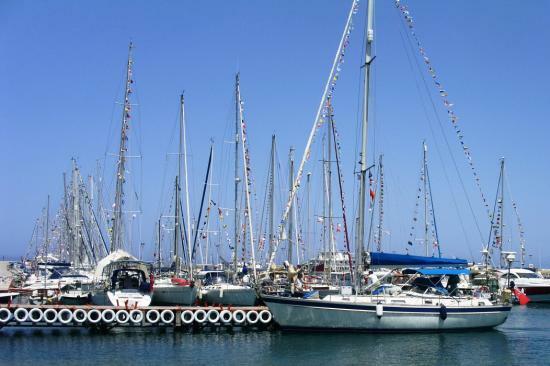 Speeches by the ministers of tourism and transport promised the sailors new marinas along the coast of Northern Cyprus which is one of the rally’s main reasons: to push the creation of such facilities for the international sailing community as the island does not offer natural safe anchoring along the coast, except a few small bays. The crews seemed fully motivated for the rest of the journey and with the evening progressing soon started to show their talents as dancing sailors just as we used to do many years ago. Our best wishes go with them: May there always be enough water under your keel!